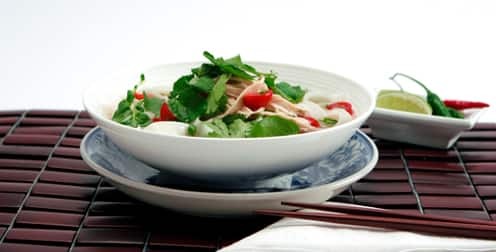 In honour of Turtle Power and ninja skills, why not try this delicious Asian Chicken Noodle soup? 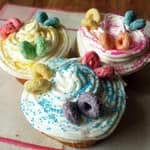 Courtesy of Best Recipes Ever. Recipe Variation: A quick substitute for the Easy Homemade Broth: Use 6 cups storebought chicken stock, 1 tbsp fish stock, 4 slices ginger and 2 smashed cloves of garlic. Bring to a boil and simmer for 10 minutes. In bowl, mix together chicken, salt and pepper; set aside. In large saucepan of boiling water, cook noodles until tender but firm, about 5 minutes. Drain noodles and rinse with cold water; toss to drain well. Divide among soup bowls. Ladle hot chicken broth over noodles. 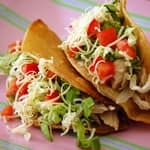 Sprinkle with shredded chicken, tomatoes, green onions, coriander and chili pepper. Serve with lime wedges. In stockpot or Dutch oven, combine chicken thighs and breasts, carrots, celery, onions, ginger, garlic, parsley, salt, peppercorns and bay leaf. Pour in water and bring to boil; reduce heat and simmer, skimming off foam, until juices run clear when chicken is pierced, about 35 minutes. Remove chicken; let cool enough to handle. Remove skin and bones; return bones to broth. Shred chicken and refrigerate in airtight container for another use. Cover and simmer broth over low heat for 30 minutes.